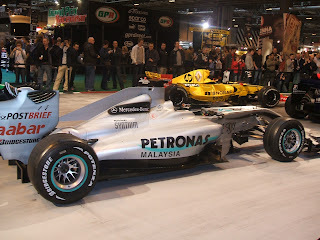 Talking about F1: The F1 blog: F1 2011 Season Preview: Mercedes - Salvaged from the wreckage? F1 2011 Season Preview: Mercedes - Salvaged from the wreckage? What a difference one test can make. After three of the four scheduled pre-season tests Mercedes looked to be struggling, perhaps to an even greater extent than McLaren. After failing to trouble the top of the testing times for the most part, team principal Ross Brawn admitted that the team were around a second off where they wanted to be (i.e. with the front runners). But just when everyone was writing them off, they turned up to the final test, in Barcelona, with a major technical upgrade, which catapulted them up the order, claiming first and third on the timesheets on day four. All of a sudden they appear to be closest challengers to the Red Bulls and Ferraris, and Schumi is talking about fighting for podiums as a minimum, and claiming the odd win. They may even be dark horses for a championship charge. To an extent, this transformation is expected. The car was completed late, due to personnel changes, so the car that was launched and debuted in testing was even more a work in progress than their rivals' were, meaning that they had much greater potential than others to find time with upgrades (and Brawn was always clear on this point in his public pronouncements). It's of course hard to tell where the upgraded Merc is on the basis of one test, but it certainly looks promising for them, both in terms of optimistic noises from the team and in terms of the stopwatch. It seems a million miles away now, but the expectations in advance of the 2010 year were high for Mercedes. The world champion constructor (effectively - with the Brawn team being taken over) with the mythical Schumi/Brawn partnership and Mercedes cash seemed a formidable package. But rapidly it became clear the extent that the Brawn team had in 2009, in order to survive, mortgaged against the future. With crude 40% staff cuts across the board, not nearly enough engineering resources had been given to the development of the 2010 machine to be able to compete at the front, meaning the car had fundamental flaws, and for similar reasons the technical development throughout the 2010 season seemed more sluggish for Mercedes than for their rivals. Their F-duct didn't work to their satisfaction until the season had almost ended, while their exhaust-blown diffuser was also problematic and never as good as that of the other top teams. Brawn, taking responsibility as always, admitted: 'There was an awful lot going on in 2009, and perhaps I took my eye off the ball and the 2010 car. But it's firmly back on now'. Indeed, Mercedes generally sound a lot more content with their new staff structure and seem to be a lot more confident now in their ability to compete against the Red Bulls and Ferraris throughout the 2011 season. They still have one of the sharpest brains in the sport, Ross Brawn, at the helm, and getting Bob Bell in from Renault as technical director is also a coup. After a difficult 2010 and with Schumi on board, the pressure for results from Mercedes HQ will be high. But even if they can't seriously compete for titles this year, more consistent podiums and a few wins would, given how far they were off it 2010, represent a successful 2011 for the Mercs. 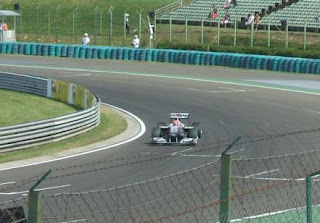 Schumi's struggle in 2010 was one of the stories of the season. His performances, ranging between the passable and the embarrassing, seemed a million miles away from the mastery of his glory years. As with Massa, several theories were offered, including that the Bridgestone tyres with their weak front end grip didn't suit his driving style, or that at 41 (now 42) perhaps age, and the rustiness associated with his three-year break, had caught up with him. As was also the case with Massa, the tyres excuse doesn't seem to hold much water, given drivers should be able to adapt, and this indeed used to be Schumi's great strength (as Martin Brundle recently pointed out, we used to say Schumi could win in a wheely bin). As for the future, Schumi did show improved performances in the final four rounds of last year, the Pirelli tyres apparently suit his driving style more than the Bridgestones, the cars will probably get more oversteery as the tyres wear, he's got a full season and subsequent pre-season testing programme under his belt and the car looks like it might be quick. So he has a great opportunity to return to the winner's circle, but the flip side is that he doesn't have as many excuses as before for not performing. Fernando Alonso, for one, refuses to write off Schumi this year, and he should know as well as anyone. Also, Schumi should be especially interested how this year's outlawing of 'crowding opponents and abnormal changes of direction' will manifest itself in terms of penalties and for what. He may have to keep a lid on his usual antics. This year will presumably confirm, either way, whether time has finally caught up with Schumi. There are plenty within the sport who reckon Nico Rosberg is the most under-rated driver in F1. This may be a consequence of the way Rosberg goes about his business, which tends to be with a relative lack of rancour and self-promotion. Indeed, Rosberg in a pre-season interview with F1 Racing recognised the importance of increasing his profile this year. His driving style in 2010 was one of consistency, ensuring he brought the car home and allowed races, and points, to come to him. It wasn't spectacular, but it was probably by far the most effective means of accumulating points when in a relatively uncompetitive car. Nico is one of the few drivers who can claim he didn't leave many points out on the circuit in 2011. Further, he seemed to lose most of the relative laziness and tendency to give up on races at two-thirds distance that he was sometimes accused of in his Williams days. As is the case for Schumi, 2011 is a great opportunity for Rosberg to prove the doubters wrong, and if the car is as competitive as the final test indicated surely his first ever GP win, and more, awaits in 2011. And that, more than anything else, will give Nico Rosberg the recognition that he is long overdue.